Rocky, Bullwinkle and the cats stayed in the U.S. today. 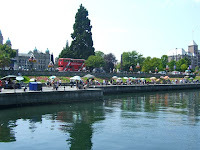 But, took an international day trip across the border to Victoria, British Columbia. 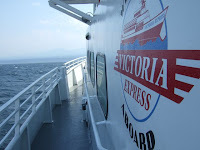 We were up and out early to catch the 8:15 Victoria Express passenger ferry. 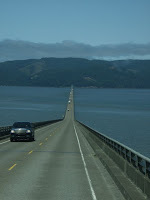 The crossing of the Strait of Juan de Fuca took a bit over an hour. 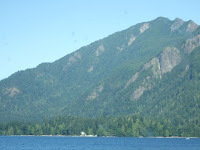 As we pulled away from Port Angeles, we had a great view of the mountains, the town and the other ferry option, the Coho. This monster carries passengers and vehicles. Lots of them. Crossing in this ship takes about 90 minutes. It took us just a few minutes to pass Canadian customs. 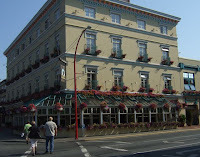 Then, we began exploring Victoria on foot. 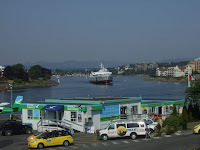 Here’s the Coho coming into port. 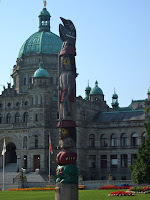 All around Victoria you can see the styles of the British and native Indians. 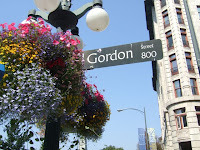 Like the many quaint coastal towns we’ve visited, Victoria sported many colorful flower baskets everywhere. We especially liked this one, which made us think of da Godfadda. 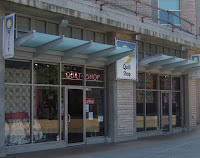 The city also features a lovely Chinatown. Just for a moment, we felt like we were back in the Bay Area. Steps away from the Chinatown gate, I spotted a place where I simply had to stop. 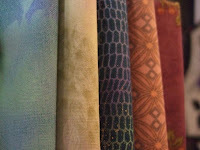 These are the fabrics I chose to represent BC in the future quilt that will capture our travels. After lots of walking, a yummy lunch, and more walking, it was boarding time again. 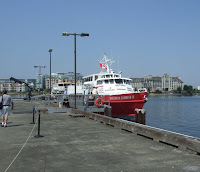 On the way out of port, Paul spotted the very ship we took to on our Alaskan cruise seven years ago. It was great to see Infinity again. We have wonderful memories of our week on that ship. We crossed a very choppy strait and were happy to see American soil again. Back in our homeland, we checked out Hollywood Beach, which is just steps away from the ferry terminal. 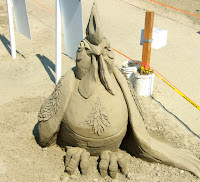 We missed Port Angeles’ Art In Action Festival, which was held last weekend. But, we made time to see some beautiful remains of the festival. 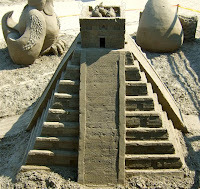 The festival featured the North American Masters Invitational Sand Sculpture Competition. Despite being exposed to the elements for nearly a week, these works of art were simply amazing. 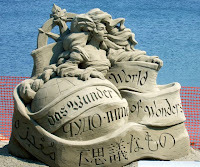 How in the world do these artists make sand do this? This piece seemed to defy the laws of gravity. As we headed back toward the moose, the temperature dropped significantly and we were greeted with coastal fog and a stiff on shore breeze. 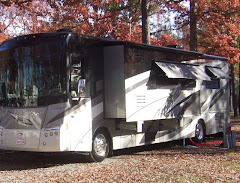 We buttoned everything up and enjoyed a restful night in our rolling home. After a few days of toasty sightseeing, we decided to kick back and do basically nothing. By 10:00 AM the temperature outside was approaching 80. An hour later it was well on its way to 90. We took a walk back up to Salt Creek to enjoy temperatures that were a bit cooler, take a few pictures and pick up a geocache. The Salt Creek Campground offers incredible views, like this one we snapped from a tent site. This spot is a favorite of friends Linda and Steven, and Deb and Rod had a great experience hosting here last year. We would’ve checked it out, but we opted for full hookups down the street. We brought the GPS along on this trip and discovered a cache we walked right by when we were here earlier. That makes three finds in Washington...so far! 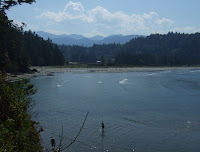 Our hike around Salt Creek gave us some wonderful views of Crescent Bay and the beach across from which we are parked. Here’s a look at the mouth of the Bay. Here’s a (Dare I say?) stunning look at the water, beach, forest, mountain and sky. 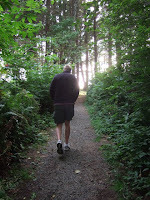 What’s not to like about Port Angeles? On the way home, we stopped at a viewpoint. What a view! We met a lovely couple here from central Washington. They were so pleased to be here, beating the heat. Here’s one last peek at the creek as we headed back to camp. By the time we got back to Bullwinkle, the winds had shifted in a much more friendly direction and the temperature was back to the mid-70s. Much better! We decided to head a couple of miles inland for a wifi fix. We had heard to nearby town of Joyce had some wifi to offer. So we checked it out. 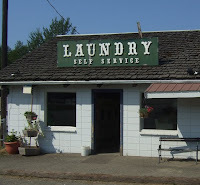 We ended up sitting in a unventilated laundromat in Joyce, WA, where the temperature rapidly approached deadly. What a difference a few miles can make. We took care of our wifi basics and made a beeline back to the water. We slept with the windows open last night, enjoying the sounds of the waves crashing on the nearby shore. After enjoying our morning coffee, we set our sights on today’s travel destination: Olympic National Park. Actually, we had traversed the Western sections of the park on our drive up the peninsula. 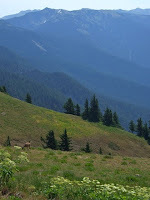 We didn’t feel like backtracking that route today, so we headed up the hill out of Port Angeles to visit Hurricane Ridge. 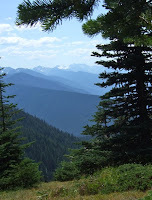 The Olympic Mountains are magnificent. We can only image how they look covered with snow. On this very warm day they were in their Summer best, with a rich carpet of cedars, pines and firs. This was the view from our picnic spot. What you can’t see here are the dozens of nasty biting flies and other bugs that were in full force in the heat. We made very quick work of our lunch and were back in the bug-free comfort of the Jeep. Between the heat and the bugs, we were ready to get back to the water. The temperature rose as we came down the hill. 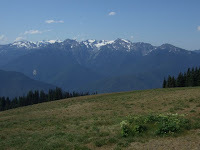 Port Angeles was one steamy place today! As we made a turn toward our campground we didn’t find quite the same relief we found yesterday. Back at camp it was still pretty toasty. 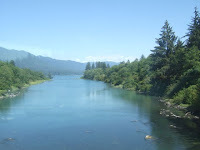 But, within a few minutes, we were blessed with a gentle breeze off the water that made everything nice and comfortable. Fellow fulltimers Deb and Rod are hanging out in Port Angeles this Summer, so we arranged to meet up with them this evening. 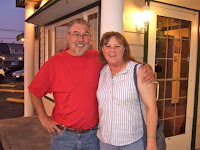 They made the journey to our cooler environs, where we enjoyed a very comfortable happy hour. We enjoyed great conversation and lots of laughs. We topped off the evening with a trip into town for pizza at Gordy’s. After a fun day trip and a great evening with friends, we settled in for another night of sleeping with our windows open, lulled to sleep by the sound of waves crashing on the nearby shore. The day after a travel day always seems to be a slow day. And, today was no exception. 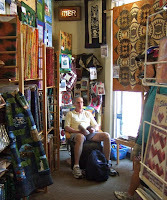 After a very leisurely morning, we ventured into Port Angeles to see what there is to see. 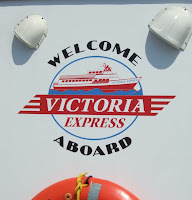 We sussed out the ferry situation, and look forward to exploring Victoria on Thursday. After perusing downtown PA a bit, we wandered to Maria’s, a new Mexican restaurant that came highly recommended from one of the hosts at our park. This blog isn’t about food, but Maria’s was a delightful surprise. Everything was fresh and very tasty. We were served by the owner, who made the experience extra special. If you’re looking for a fresh quesadilla or burrito served with the healthiest “refried” beans you’ve ever tasted, stop by Maria’s on Lincoln the next time you’re in or around Port Angeles. The temperature was getting down right toasty in town. So, after lunch we decided to run a couple of quick errands and head back to the water. We wandered to Walmart to pick up a few things. (Two Walmart’s in two days? What’s that about?) With no television at our rolling home, we decided to check out redbox. We rented Gran Torino and made plans for dinner and a movie at home. A quick stop at Safeway and we had everything we needed for the night. Back at the moose, we were greeted with a significant drop in temperature. With a heat wave forecasted for this week, we’re so glad to be so close to the water. We teamed up to get the bugs off Bullwinkle’s windshield to better enjoy our priceless view. With our chores behind us, we kicked back and read a bit. I finished Lying Awake. (What a great feeling to finish a book!) Paul continued to work on the hefty The World is Flat. We set out on a “short stroll” before getting ready for dinner. That stroll became a two-mile-plus hike to nearby Salt Creek Recreation Area. 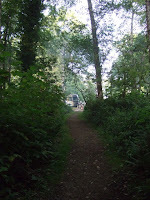 We enjoyed a walk above the beach, by a World War II bunker, through the woods and around a campground filled with happy campers. Of course, since we were just going for a stroll, I didn’t take my camera. (When will I learn?) But, we’re sure to return there later in the week for a snap or two. Back home, we enjoyed dinner with views of another magnificent sunset (through our freshly cleaned windshield), then fired up the DVD and enjoyed the rest of the evening with Clint Eastwood. When the plan for a travel day involves a mere 150 miles, that sounds like a pretty easy day. 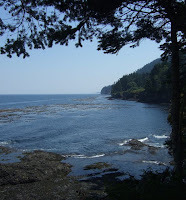 But, when it’s yet another day on scenic Highway 101 along the coast, we knew we were in for quite a drive. And, it didn’t disappoint. Some six hours after leaving Bay Center, we arrived at the Crescent Beach and RV Park on the western edge of Port Angeles. 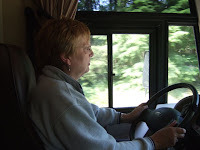 Our big stops of the day were a quick stop at the Walmart in Aberdeen for a few essentials, and a lunch stop in Forks. (Sorry to disappoint any readers who are fans of Twilight, but we didn’t know we had arrived in the mecca of that saga.) Other than that, our attention was on the road. Although it was less winding than previous days, the road was at times narrow and dotted with the requisite 25 mile per hour small towns. 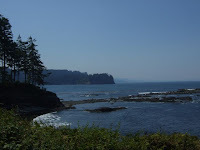 We caught our last glimpse of the Pacific Ocean and headed east, at last, only to see the road narrow for some 15 miles of winding road around Crescent Lake where the speed limit was 35 miles per hour. The lake, however, was beautiful. This time Paul had the pleasure of trying to get a drive by shot. 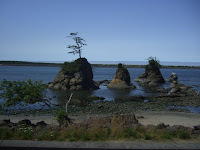 Our RV park is located just across the road from a beautiful half-mile stretch of beach on the Strait of Juan de Fuca. From here we can see Canada! Bullwinkle is safely wedged into a back-in site with an amazing view. With no cable, satellite or wifi, our communications and entertainment options are a bit limited. But, we’re looking forward to chilling out for the next six nights. We’ll find a wi-fi hotspot when and where we can and post from there. For now, we’ll kick back, relax and enjoy the sunset. P.S. Many thanks to Bay Center neighbors Pauline and Roger for last night's tasty root beer floats. What a treat! After sleeping in most of the morning, then spending much of the afternoon attempting to load Washington maps on our GPS, we rethought our plans for a full day of geocaching. Instead, we headed for nearby Bruceport County Park for a bit of exploring. 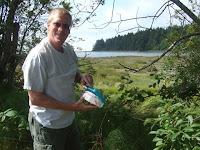 Along the way, just at the end of Bay Center Dike Road, we found our first Washington cache. 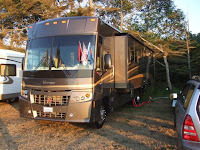 Bruceport County Park is a large park that features a campground with a few full hookup RV sites for $21 per night, (What a bargain!) 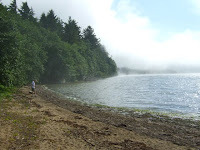 many attractive tent camping spots, and a half-mile-ish trail to the Willapa Bay shore. 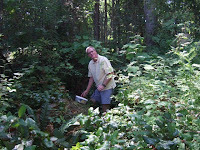 It's also home to two caches. 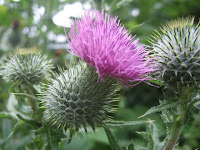 We found one that was hidden among the tent sites. 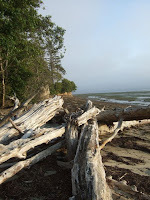 The other was elusive, and had us combing the beach and nearby trees. With a "Did Not Find" at the beach, we appreciated the beauty along the trail along the way back. Many budding berries and flowers lined the path. 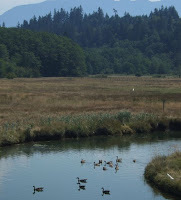 Tomorrow we'll travel up the West side of the Olympic Peninsula to Port Angeles, where we are looking forward to exploring Olympic National Park and Victoria, BC. Our second day of coastal driving was some 30 miles shorter than yesterday. But, it seemed much longer! We covered a mere 140 miles today. And, it took us nearly four hours to do so. 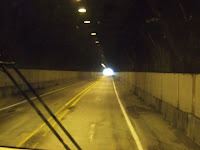 Between the curves, narrow roads and tiny towns along the way, we were crawling. Again, no good places to stop a northbound motorhome on 101, so I did a drive-by shot of this interesting spot along the coast. Next time we're through these parts, we promise to make an overnight or two and do some exploring. Nobody told us about THIS tunnel! We cleared it with room to spare, of course. 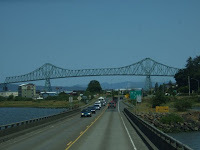 The highlight of the drive was crossing into Washington over the Astoria bridge. 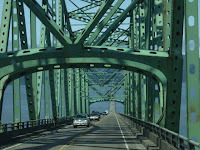 This continuous truss bridge spans the mouth of the Columbia River. 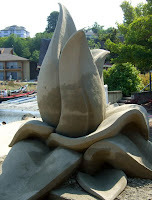 Its highest point sits nearly 200 feet above the water at high tide. And, yes, it's one lane of traffic each way. From the top, it's downhill toward Washington. The views were impressive. 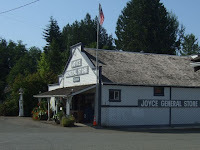 After arriving at our campground some 40 miles north of the Columbia River, we jumped in the Jeep and cruised up 101 to the town of Raymond for provisions. Raymond is a lovely little town with a commitment to art. Along the highway and throughout downtown Raymond are 200 steel plated figures of wildlife and historic humans. The Raymond Wildlife-Heritage Sculpture Corridor is a real treat. 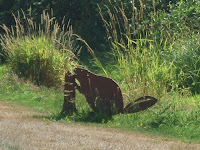 This busy beaver on the roadside is just one small example of the work we saw around town. If you're cruising 101 in these parts and are ready to see something besides seashore, it's definitely worth a stop. 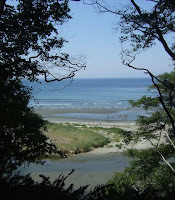 Our campground sits about 200 yards from the shores of Willapa Bay. We took a stroll down the short path to take in the view. 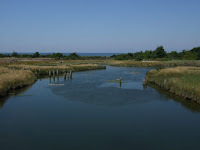 This is one of those places that is best appreciated at high tide. We arrived at low tide and there just wasn't much to see. We'll check the tide tables and be back. Can you spot the big moose at the end of the trail? Here's a sunset shot of our spot at this KOA. It's a fine enough park, filled to the brim with weekending families. Wifi is spotty, so we may or may not be able to provide a timely post of tomorrow's adventures. We've found an interesting little strand nearby that is loaded with geocaches. Could make for a day of great views and nice finds.